The DR wheelhead radiator control valve has a pre-setting function using a double cone, which is also suitable for thermostatic operation. A straight and angled model is available, and all are nickel plated, with a white screw disk and handwheel protection caps. 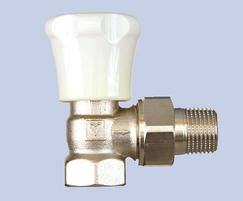 The valve is suitable for hot water heating systems where high-precision adjustment and low cost solutions are required. The valve can be installed in air conditioning systems for exact adjustment of cooling and heating units. It can also be used as a circuit control valve.